A loving Sister's campaign highlighted by Ann Oakes Odger . On Wednesday 13th December, 2006 I was privileged to be invited to join a delegation of families with the common cause of ’Knife Crimes’ on the agenda…to meet with The Hon. Mike O’Brien QC - Solicitor General at Buckingham Place, SW1 and later the same day to meet with Tony McNulty, the Policing Minister at the Home Office. 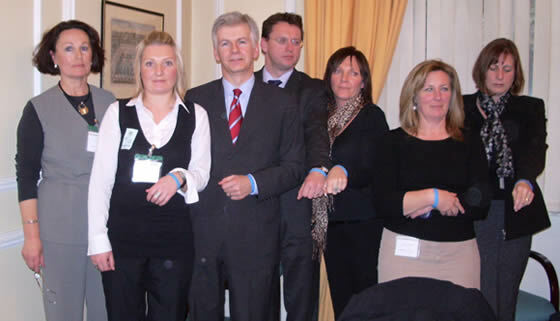 On Wednesday 13th December, 2006...I was privileged to be invited to join a delegation of families with the common cause of ’Knife Crimes’ on the agenda…to meet with The Hon. Mike O’Brien QC - Solicitor General at Buckingham Place, SW1 and later the same day to meet with Tony McNulty, the Policing Minister at the Home Office. We entered Westminster Hall just as Prime Minister’s question time finished…to mingle with many Ministers along with Bob Geldof, before moving on to our first meeting at l pm. The meeting was arranged by Lucy Davis, who had previously met with the Lord Chancellor Lord Falconer on the 9th June at which time she was supported by her MP for Reading East, Rob Wilson. Those attending Wednesday’s meetings included Tom Ap Rhys Price’s mother - her Son Tom’s murderers were recently convicted. Daniel Pollen’s mother, along with his friend Andrew Griffith’s mother. I joined the party of families with ‘Be Safe Project’ co-founder David Morris, to further the education programme…’Knife Talk’ aiming to educate against young people carrying weapons. The ‘Knives Cost Lives’…what every teenager should know campaign by Lucy Davis was launched in the wake of her brother Scott’s murder, and has been running since May, 2006. On the 13th July 2001, Scott was out celebrating a friend’s birthday and I had dropped him into town. in the hands, arms and chest with a knife!”. Like myself…all those present had the same agenda, to highlight the problem of ’Knife Crime’ and get increased Sentences. This means a change in the current system of discounts in ’Sentencing’ that has been introduced. Mike O’Brien listened carefully to the concerns raised and confirmed that he would look at points raised by each family, to look at each case individually. He also said that the Government would be conducting a review in a couple of months...the issue of ’concurrent sentencing’ was also raised and requests made to review. Today, 14th July, 2014 is the 13th anniversary of the brutal murder of Scott Davis...and is sister Lucy is asking people to support 'Scott's Law. Lucy Davies lost her brother in a frenzied attack outside The Oracle in 2001...he was just 25 when he was stabbed nine times with a butterfly knife. His murderer, then 18 year old Kevin Alvarado, was high on drink and drugs at the time of the attack. Following the fatal attack...the 'Knives Cost Lives' campaign was launched in 2006, supported by Reading East MP Rob Wilson, calling for tougher sentences for those caught carrying knives.